Crispy Food markets muesli with two simple demands: its contents have to be ecological and it has to taste great. envision:design got the assignment to express these two things in a concept and design packaging for the European market. 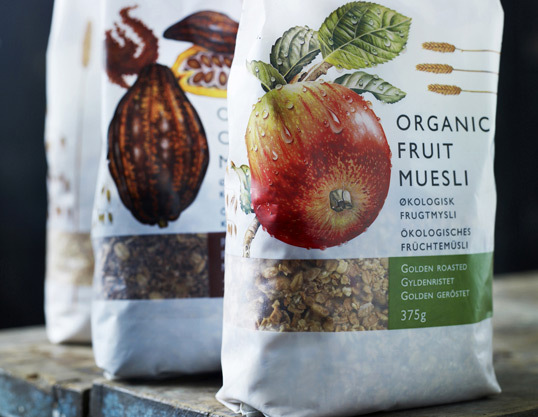 The concept: “Muesli: the way it was meant to be” was the basis for design and communication. The design is based on traditional English textbook illustrations of the ingredients. This adds originality and emphasizes the ecological aspect without being boring. 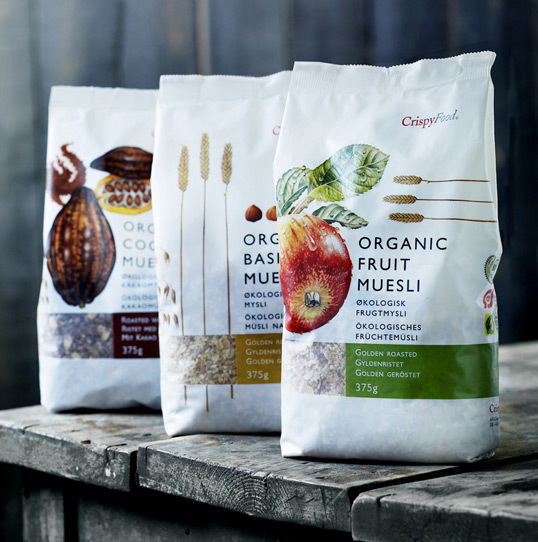 These componets are put into a light and simple Scandinavian design universe that challenges the way consumers are used to seeing muesli in the supermarkets. The illustrations are made by the British illustrator Roger Kent and Danish Illustrator Susanne Weitemeyer. The color scheme works very well, and I love the clear area in the packaging where you can see the granola. I would definitely be tempted to buy some, after seeing it! I also like the semi opaque white packaging, and the grab and go shape. Good find!